I have an interesting opportunity and a quandary, and I’d like to describe them to you. One of the goals I set for myself when I published PERISHABLES was to experiment with different means of promotion via The Perishables Project. As part of the project, with each novel I’ve set a goal of selling ten copies to persons I do not already know using various promotional means and I’ve been successful (and then some, but not profitably so) in each attempt. That failure of profitability – the knack writing has for *not* funding itself – is something that came up recently at Illogicon. I was on a panel on Diversity and Representation in Fantasy and Science Fiction and an audience member asked how we tell unconventional stories and still make money. I answered honestly that I do so by having a day job. I don’t make money as a writer. I’ve always maintained a fairly bright line between my writing and that day job. I don’t want one to impact the other. Within my workplace I’m in some minor ways sort of high profile and don’t want my writing to distract from what I do. Writing has also always been an escape from conventional work. When I do writerly things I don’t want to think about my day job. I don’t want people asking me computer security questions when I’m trying to tell stories. That barrier has always been important to me. Now, the quandary: this week I’ve been asked if I’d agree to be profiled by the Raleigh News & Observer. They’re doing a series on persons in the Triangle with an artistic pursuit and a day job and how they balance those. The person writing it has a great reputation and is a great local writer, the paper is great, and yet I’m a little nervous. This would be fantastic exposure at no cost: exactly what The Perishables Project strives to find and try. What writer would say no to that? It would be insane to say no. Still, there’s a part of me that clings to the bright line between the office and my writing and this is a story *about that bright line*. A part of me is just terrified of highlighting it, terrified of drawing that sort of attention to myself. This morning I”m about 90% on saying yes to this offer. To turn it down would be madness, right? Surely it would. Even if it feels like taking a spotlight and shining it directly on the one boundary in my life I’d most like to protect. Anyway, thanks for reading. I just needed to get all this out somewhere and one assumes you’re all people interested in hearing about my writing and what I do around it. If you have an opinion, feel free to express it. 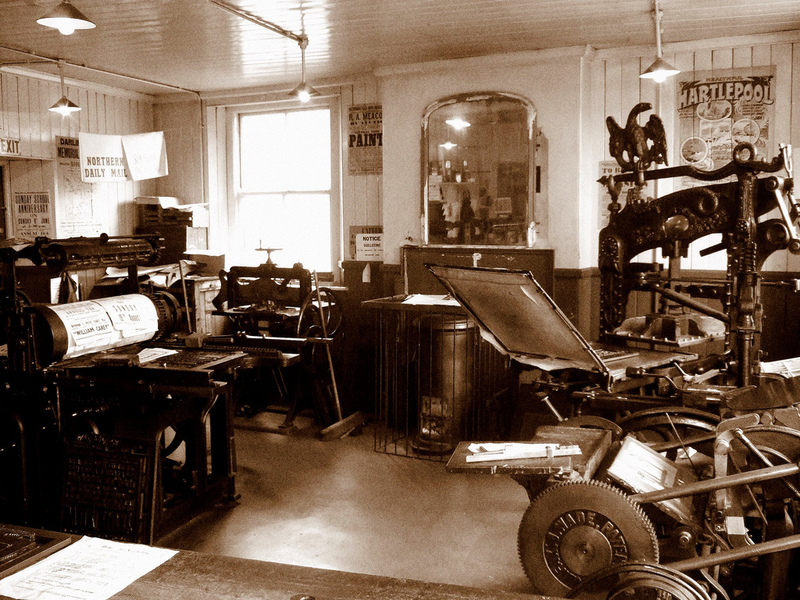 Photo credit: “Print Room Beamish” by David Masters, unmodified, available under Creative Commons 2.0, Attribution Generic. Consider other areas throughout your life where you tried to keep parts of your life separate. That only works for a while. Eventually, the truth of who we are becomes exposed. If you are prepared for the life that you will live when the exposure happens, you will be in harmony with it. If you are not prepared, you will always feel bitterness.